There are many river crossings in the Mara, and in several other smaller rivers. Crossings can also take place both ways. 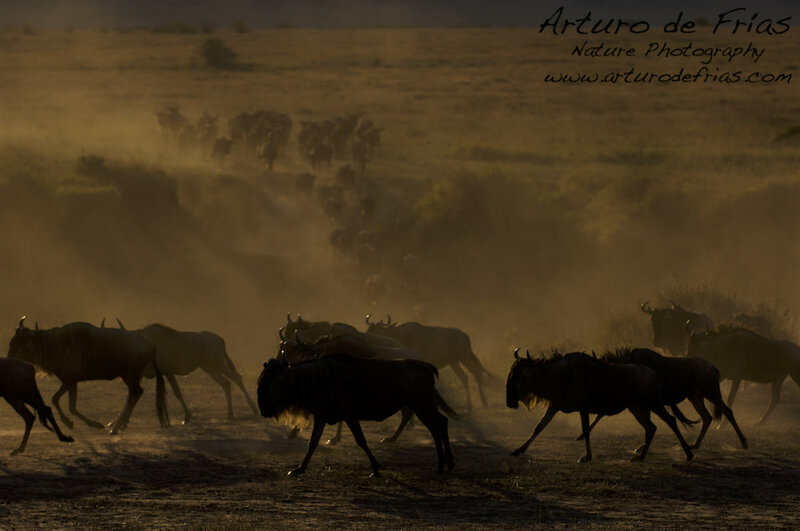 In fact, a wildebeest (Connochaetes taurinus) herd can cross from one side to the other, with the corresponding number of deaths, and just a few hours later cross back again. Wildebeest behaviour is not precisely known by its common sense... We saw this herd of wildebeest, crossing a small river, just 10 minutes after having landed in one of the Mara airstrips. Hay muchos cruces en el Masai Mara. El rio Mara es el mas grande y tiene los cruces mas famosos pero hay varios ríos menores. Los cruces pueden producirse en las dos direcciones. De hecho, no es raro ver un gran rebaño cruzar n un sentido, con el correspondiente numero de muertes, para cruzar de vuelta por el mismo sitio solo unas horas después. No son animales muy inteligentes... Vimos este cruce en un pequeño río, 10 minutos después de haber aterrizado en una de las pistas del Masai Mara.